The design and layout of a landing page is discussed in point #1 below. What? Wait a minute. I’m writing about landing pages? I AM a landing page. Try clicking me. If I were a car, I would be a convertible. 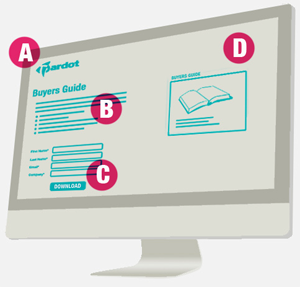 Ok, with my puns out of the way, we can move onto the serious stuff – how to create a successful landing page, and I’ll use an infographic (courtesy of Pardot) to show you how. Design & Layout: this part refers to the image on the right. A – Keep the branding and styles consistent with the experience people will receive after the click (if they are visiting your website for example). B – A strong value proposition that communicates immediately what you are offering and how it can benefit your visitor. C – Simple and easy to complete forms with a strong/descriptive call-to-action. D – No navigation! Those nasty page leaks have no business on a landing page. Form Essentials: Only ask for the essential information to limit the number of fields (lowering the barrier to conversion), and collect an email so that you can keep the conversation going. Providing Value: Three basic rules here; make your page relevant (are you appealing to your target audience? ), valuable (is there a direct benefit, like a reward or special offer? ), and timely (is your page being presented at the right stage of the sales cycle to nudge your prospect further down the funnel?). Analyze & Revise: Set goals, so that your landing page has a purpose. This helps you to measure the success of that goal (a conversion) and move into a revision (optimization) phase. Many people think that landing pages are simple, and this is quite a simplistic look at how they should be created. But the reality is that there’s much more to a successful landing page, and that includes understanding your target market, matching your upstream ads, and optimizing the page to get the biggest conversion lift possible. For a deeper look into where landing pages fit in the conversion funnel, and which elements should be included on your page, read “The 12-Step Landing Page Rehab Program“. You can change what gets tweeted before it goes out, so don’t be afraid to click.